Part 2 of our Syllabus feature covers changes in the Arts Syllabus, most notably the abolishment of the Paper 1-Paper 2 split for Geography in favour of an integrated syllabus. We interviewed Mr Jason Lai (Geography tutor) and Ms Krishnan Mullaiselvi (HOD: Arts) to get the low-down on these changes. From a broader perspective, what exactly does the new syllabus aim to do? Changes in the ‘A’ level syllabus are aligned to changes in teaching and learning of History at the secondary levels. For example at Lower Secondary, students are expected to work in groups and engage in historical investigation of a specific issue. This is the case for Geography as well. In terms of outcomes, for instance, History education aims to make our students critical thinkers who are discerning of what they read and to be comfortable in dealing with complexities and ambiguities of developments around them. It is not about achieving mastery of facts which can be obtained through the internet. The 21st century requires a different kind of student, and this is what ‘A’ level education is trying to achieve. We understand that that Y5-6 Geography will no longer be split into Physical and Human Geography. Instead, an integrated syllabus will be introduced structured according to 3 major themes. To the best of your understanding, what is the rationale behind this drastic change? To be more specific, we have a fourth theme as well, namely Geographical Investigation. The rationale for it would be to turn geography into a more holistic and realistic subject. We have to take stock of the fact that geography is both a social science as well as a humanities subject, with elements of physical science thrown into the mix as well. What the Ministry of Education is trying to do with the new syllabus is to draw connections between these domains. The new syllabus draws cross-linkages between physical and human geography to deepen student’s understanding of the discipline, and to make the discipline more engaging. Students have also traditionally found a syllabus with separate paper for physical and human geography harder, so the new syllabus is aimed at alleviating the problems students face. The new syllabus also seems to emphasize higher order thinking skills – for example, a 20 mark essay in band 5 has to show “strong evidence of synoptic thinking where knowledge from different topics is synthesised purposefully. “ SBQs also include two 9-mark, open-ended questions. To what extent do you think that this shift in focus makes the new syllabus more challenging for students? Well, the syllabus, being a new one, will have its own sets of new challenges for students. The word ‘synoptic’ has for instance been thrown around quite a bit since the introduction of the new syllabus. Level 5 Essays require synoptic link between different topics, which means that for instance, students will have to draw interlinkages between the physical phenomena of floods and the human factors behind flooding. It may seem more challenging, but the aim is really to steer away from seeing geography as a compartmentalized subject and to make it more balanced instead. Synoptic links will only be expected in H2, and only for 20 marks questions however. What part of the new syllabus do you think students will enjoy learning the most? This is quite a personal question. MOE is trying to make geography more interesting in that the issues covered are more current. Personally, topics like sustainable development and issues like climate change to me are very interesting to teach and to learn. Personal question – MOE tries to make geography more interesting, new syllabus is a content reduction of 10-20%, but they added in new stuff as well. Apart from Development, we will also be looking at how development across different countries is uneven and how the policies of supranational bodies like the IMF for instance cause both benefit and harm to different countries. While geography is a content-based subject, values like empathy still underpin it. Singapore has been very advantaged in many ways. I think it’s important to think about how exactly we reached this stage of development. How do you expect the new syllabus, with the new focus on human geography, to affect candidature? The aim is to have a balanced approach, so even though on the whole, the topics seems very human in nature, within each subtopic, there are elements of physical geography. 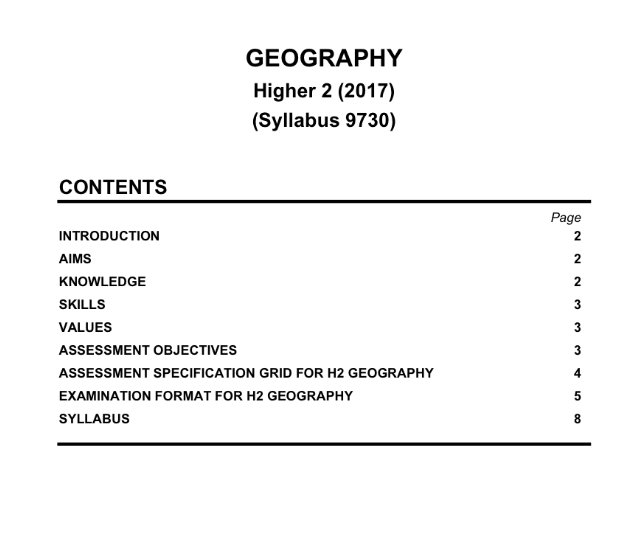 Why we removed some of the physical geography topics is because they are already covered in the O Level syllabus: there is no point in repeating it. Instead by interweaving elements of physical geography, we can facilitate a more holistic learning of geography. Looking at the numbers yesterday, it seems that more students are interested to take up Geography. Some students who missed the JIP period asked about how to choose between Geography and Economics. As long as you’re interested and passionate in the subject, you should try a hand on it. Students should make decisions based on their interest, not solely based at syllabus observation. What can students do to better prepare for the new syllabus? There is no 10 year series for the new syllabus and no question bank. Every school faces the same challenge in that sense. Some of the past year questions could be relevant, although students will have to be discerning when taking a look at these questions. To excel in geography the requirements are the same as those for any other subject: you need to be consistent, conscientious and hardworking. Our notes are structured so as to give you more than enough. We can’t teach students every single case study though, so students should read up pertinent examples, in say, Time or the Economist. Even things they read in GP may prove useful. It’s important for students to see interlinkages between subjects. To the best of your understanding, why was the weightage for source-based questions increased, and the weightage for essay questions decreased? 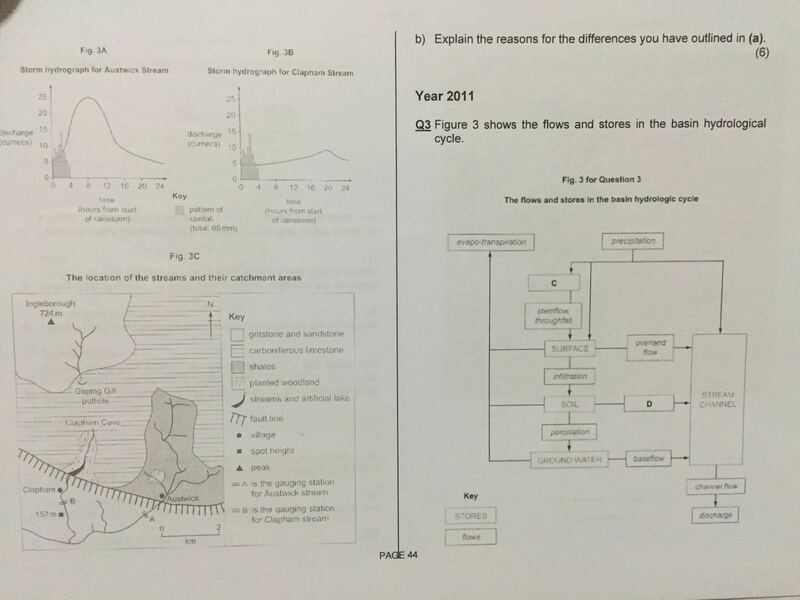 From 2006 to 2015, ‘A’ level History assessment had 1 compulsory SBQ and 3 essay questions. Weighting was 25% for SBQ and 75% for Essays. From 2016 there will be a slight change with 1 compulsory SBQ and 2 essays, and the weighting will be 40% for SBQ and 60% for essays. Greater emphasis is placed on SBQ to deepen students’ understanding of the nature of the discipline. Students must understand how historians work. They must be able to employ the methods historians use to construct knowledge. So SBQ is incorporated as part of the assessment to teach our students the craft of a historian: how to interpret different sources, how to reconcile competing interpretations and how to evaluate and make judgement. This does not mean that essay writing is not important. Answering a specific question will demand students to think critically of the issue, question assumptions and show understanding through their arguments. History questions revolve around concepts such as cause and effect, change and continuity and essays will allow students to explore these concepts at a deeper level. To the best of your knowledge, why was the number of essays to be written for each paper decreased from three to two while the exam duration remained unchanged? Reduction in the number of questions must be placed in context. Unlike the old syllabus, SBQ now will have 2 parts. It will test different skills and students must read the sources very closely to analyse them. This will demand more time. Essays have been reduced in quantity to cater to this change. We also do not want students to rush through the essays. 2 essays, we feel, are sufficient in judging whether or not students have grasped the concepts and skills. It will allow students to demonstrate greater depth of thinking and analysis in their writing. In terms of content, what is the significance of the addition of the Asian Tigers and the Vietnam War to the syllabus? During syllabus reviews, it is common to see some topics to be removed and new ones to be included. Inclusion of a new topic such as Rise of Asian Tigers (South Korea and Taiwan) from 1970s to 1990 is intended to understand various models of economic development. It is also an attempt to have more balanced understanding of the global economy which is not just US and Europe alone. Given that Asia is one of the fastest growing economies today, it is only logical to understand the economic transformation of countries like China, Japan, South Korea and Taiwan. Vietnam War is not a new topic. It was taught before 2006 but removed in 2006 in the international History paper as there was a need to keep the content manageable. Part of the reason is that in 2006, H1, H2 and H3 syllabuses were introduced for the first time. But Vietnam War was taught in Southeast Asia History in the context how Vietnam fought against the French and US for its independence, the fear of communist Vietnam in the region and how that led to the formation of ASEAN. In the new International History syllabus, Vietnam War is included as one of the case studies for the extension of Cold War outside Europe and students will be exposed to different interpretations through sources. What should students who are interested in history keep in mind? Students must have genuine interest and passion for the subject and appreciate how the discipline works regardless of the content that is covered. They must appreciate key developments in the world and the region. Current developments can be only understood with the knowledge of the past. You can’t understand significance of Aung San Suu Kyi’s election victory in 2015 without knowing the political context of Myanmar after independence. Students must be comfortable in handling content, concepts and skills of analysis.